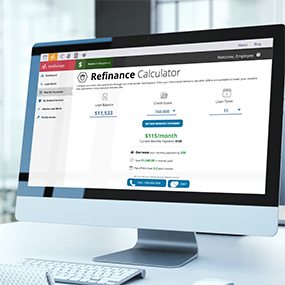 Refinancing is a great way for well-qualified borrowers to lower payments, consolidate multiple loans, or achieve huge savings over the course of repayment. 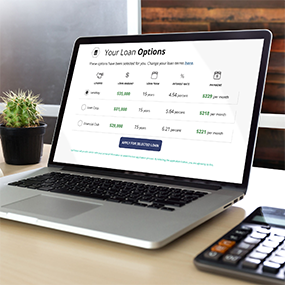 We put options at your fingertips via a multi-lender marketplace and give you the opportunity to choose a great refinance offer that fits your specific needs. Note: Student loan refinance is not right for everybody. See our Disclosures page to learn more about the impact of refinancing federal student loans. Review our student loan refinance disclaimer. Compare multiple possible offers to make sure you get the best rates and terms available. 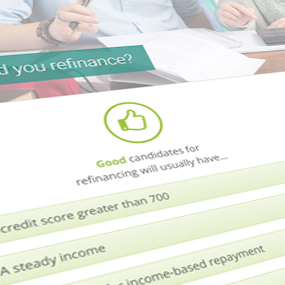 IonTuition is not affiliated with any refinance company. By requesting transfer to a refinance company, or navigating to a refinance company's website from our website, you will be transferred or sent to another company. IonTuition may receive fees for this referral. Should you decide to refinance, please be sure to read the fine print and understand what you are agreeing to. Consult a licensed professional if you have any concerns.